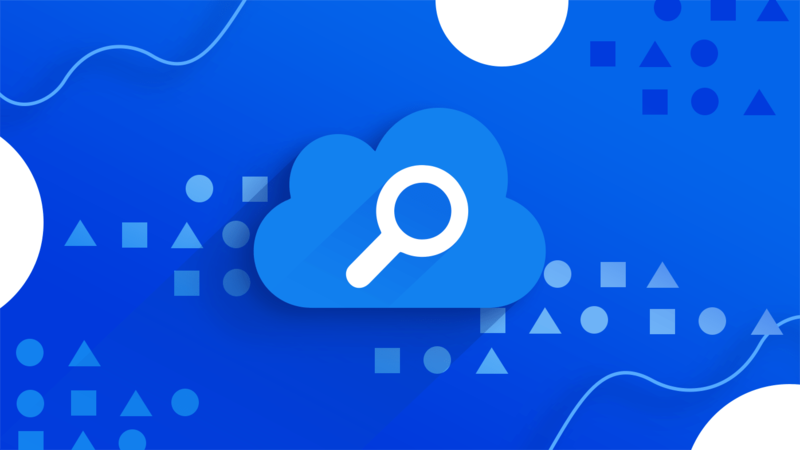 In the first part of the article, we briefly reviewed two popular search-as-a-services: Microsoft (MS) Azure Search and Elasticsearch. In this part, we will show in practice how to work with some commonly used features of Azure Search on the example of searching the restaurant. We will provide a walkthrough on how to create an Azure free account (with a brief overview of the Azure portal itself), search resource and how to work with them. MS Azure supplies the ability to create a free trial account with $200 credit for 30 days, 12 months of popular free services and, of course, 25+ always free services. You need to provide a phone number, a credit or debit card, and an MS Account username to start using it. Also, keep in mind, that for creating an account, you need to have some money on your card, because you may see a one-dollar verification hold on your credit card account, which is removed within three to five days. On the “Azure Free Account FAQ” page you can read a bit more about provided services and trial accounts. URL – you need to provide a service name, which is also a part of the URL endpoint against which API calls are issued. For example, our test endpoint will be https://intro.search.windows.net, so in the URL field was entered “intro”. Subscription – select needed subscription (you can have more than one). If you create a free trial account, then you see “Free Trial” subscription selected. Azure Search can autodetect Azure Table and Blob storage, SQL Database, and Azure Cosmos DB for indexing, but only for the services within the same subscription. Resource group is a collection of Azure services and resources used together. For example, if you use Azure Search to index a SQL database, then both services will be a part of the same resource group. If you have just created an account, then you can click on the “Create new” button below the field and create the resource group by entering a name. Location, it is where an Azure service will be hosted. And for future reference, you need to keep in mind, that prices can differ by geography, and, if you are planning to use cognitive search, you need to choose a region with feature availability. Pricing tier – currently Free, Basic, and Standard pricing tiers are offered. Each of them has its own capacity and limits. For this example, we will choose “Free” pricing tier, which is limited to three indexes, three data sources, and three indexers. For future needs, you have to remember that a pricing tier cannot be changed once the service is created. If you will need a higher or lower tier later, then you will need to re-create the service. See “Choose a pricing tier or SKU for Azure Search” guidance from an official site for more information. On the service overview page, you can locate the URL endpoint, usage information, activity logs, keys, and much other useful information. You also need your keys, which you can find by clicking on the “Keys” section in the navigation pane. When creating our test project, you will need to copy one of the admin keys (they are equivalent), as this is required for creating, updating, and deleting objects on the service. So, let us create the project and start exploring the Azure Search functionality. We will add new functions gradually to consistently review all the steps and to achieve a maximum understanding of what is being done. enter your project name, its location and click “OK”. As we will use the .NET SDK, now, we need to download it through the NuGet package manager. 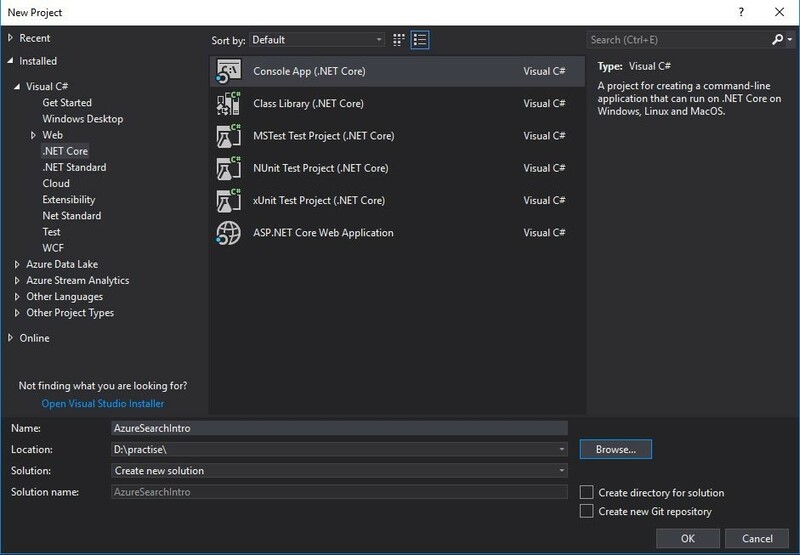 For this, just right click on the project name, select “Manage NuGet packages…”, switch to “Browse” tab and search for the “Microsoft.Azure.Search” package. make sure that the appsettings.json file the property “Copy to Output Directory” is set to “Copy if newer” so that the application is able to access it when published. IsSearchable marks the field as full-text searchable. This also means that it will go through analysis such as word-breaking during indexing, e.g. if you set a searchable field to a value like “azure search”, internally it will be split into two individual tokens “azure” and “search”. IsFilterable allows the field to be referenced in filter queries. This attribute differs from IsSearchable in how strings are handled. Filterable fields of type Edm.String or Collection(Edm.String) do not undergo word-breaking, so comparisons are for exact matches only. For example, if you set such a field value to “azure search”, then filter by ‘azure’, there will be no matches founded, but if you filter by ‘azure search’ matches will appear. IsSortable indicates whether the field can be used in OrderBy expressions. By default, the system sorts results by score, but according to the experiences, users will want to sort by fields in the documents. Fields of type Collection(Edm.String) cannot be sortable. IsFacetable is typically used in a presentation of search results that includes hit count by category. This option cannot be used with fields of Edm.GeographyPoint type. You can read more information about attributes from the official documentation. Also, remember that the length of the filterable, sortable, or facetable Edm.String fields cannot be more than 32 kilobytes. This is because such fields are treated as a single search term, and the maximum length of a term in Azure Search is 32K kilobytes. You can store more text in a single string field if it is excluded from the index. The field counted as excluded when it does not have filterable, sortable, and facetable attributes (or in the REST API they are explicitly set to false). This is useful for fields that are not used in queries but are needed in search results. Excluding fields from the index also improves performance. The SerializePropertyNamesAsCamelCase attribute actually tells the SDK to map the property names to camel-case automatically. It ensures that Pascal-case property names in the model class are mapped to camel-case field names in the index. When designing model classes to map to an Azure Search index, the official Microsoft recommendation is to declare properties of value types such as bool and int to be nullable. If you do not use a nullable property, you have to guarantee that no documents in your index contain a null value for the corresponding field. For example, all types are nullable in Azure Search, so when you add a new field of type Edm.Int32 to an existing index, after updating the index definition, all documents will have a null value for that new field. If you then use a model class with a non-nullable int property for that field, you will get a JsonSerializationException when trying to retrieve documents. As you can see, at first we retrieve the service name and API key from the appsettings.json file and create a new SearchServiceClient object, which allows managing indexes. Next, the Main checks whether the index with name “restaurants” exists, and if no, create it. If you run this example, you will see in the Azure portal that you now have 1 index with 0 documents and 0B storage size. Upload, the document will be inserted if it is new and updated (replaced) if it is existing one. Note that all fields are replaced in the update case. Merge updates an existing document with the specified fields. If the document doesn’t exist, the merge fails. Any field you specify in the merge will replace the existing field in the document. MergeOrUpload, if the document with the given key already exists in the index, it will be replaced, otherwise, it will be added. The other thing to notice is a catch block that handles an indexing error. Azure Search service can fail to index some of the documents in the batch if your service is under heavy load. The official Microsoft recommendation is to handle this case and retry indexing failed documents, or do something else depending on your needs, e.g. at least write to the log file. Filter expressions constrain the search to specific fields or add match criteria. They can be executed standalone as a fully expressed query, or clarify a query that has additional parameters. We will review filter expressions later below the search parameters overview. OrderBy parameter accepts a list of the sort criteria, where each of criteria can be the name of a sortable field, a call to the geo.distance or the search.score functions. You can use asc (default order) or desc to specify the sort order. The order of expressions determines the final sort order. the full Lucene query parser used for advanced query constructs like regular expressions, proximity search, fuzzy and wildcard search, etc (QueryType.Full). SearchMode indicates whether any (“SearchMode.Any” default option) or all (“SearchMode.All”) of the search terms must be matched in order to count the document as a match. IncludeTotalResultCount specifies whether the total count of results is needed or not in the response. The default value is false. Top specifies how many items need to be returned. Can be also used with “Skip” parameter for pagination, which specifies how many items need to be skipped. logical operators (and, or, not). le – less than or equals. all can only be used with simple inequality expressions or with a not search.in. Geospatial functions geo.distance and geo.intersects, which are used for “find near me” or map-based search controls. The search.in function, which checks whether a given string field is equal to one of a given list of values. The search.ismatch function evaluates search query as a part of a filter expression and returns all documents that match this query. The search.ismatchscoring function is pretty similar to the search.ismatch function. The only difference is that the relevance score of documents matching the search.ismatchscoring query will impact to the overall document score, while in the case of search.ismatch, the document score will not be changed. You can read more about the intricacies of each of the described parameters in the official documentation. Term boost can be useful when you want to implement a search, within which the user will be able to enter a few separated words and the order of these words will show the relevance of each word. For example, if the user on the site of cinema enters “horror, thriller, drama” in the search box, with term boosting on the top of the results there will appear horror movies, then thrillers, and then dramas. In this article, we reviewed on practice a couple of the most common usages of Azure Search. The provided functionality is much wider and, we hope, that while reading, you understood the basic principles of use and got inspired for further studies. 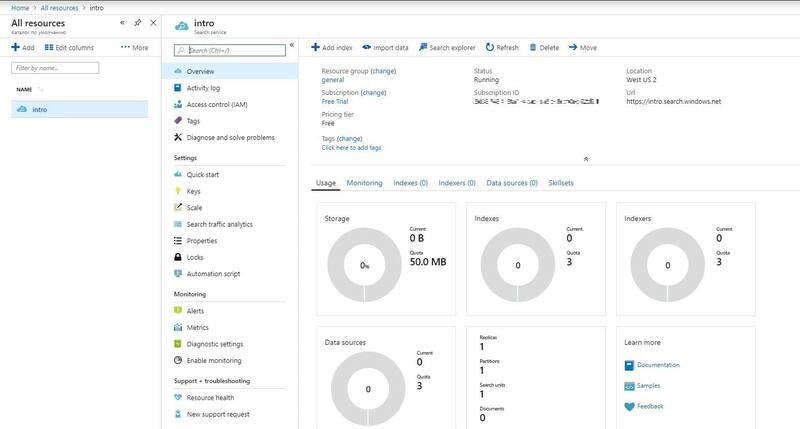 Azure Search or Elastic Search: What’s Best for Your Application? The Drawbacks Of Low-Fi Development Or How To Recognize A Crap-Coder?